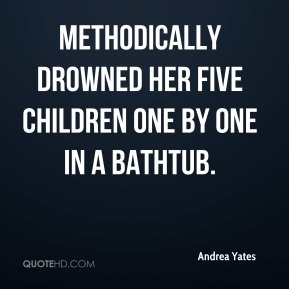 methodically drowned her five children one by one in a bathtub. 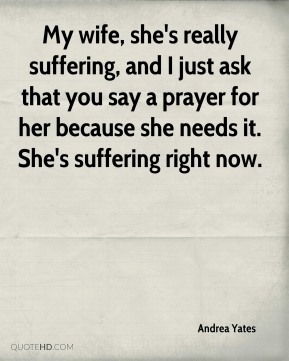 My wife, she's really suffering, and I just ask that you say a prayer for her because she needs it. She's suffering right now. Mommy, what's wrong with Mary? It could be worse if she'd been given the death penalty, but it wouldn't have been that much worse. The children were going to be tormented the rest of their lives, and they were going to perish in the fires of hell. because she was having depression from having kids. I said, 'Is anyone hurt?' She said, 'Yes.' I said, 'Who?' She said, 'The children. All of them,' ... My heart just sank. 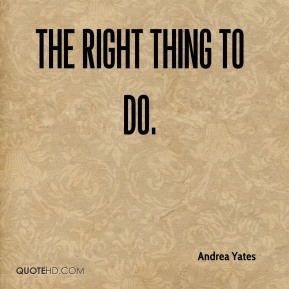 Andrea is more upset now than before because she is getting better and realizes what happened. We didn't see her as a danger. 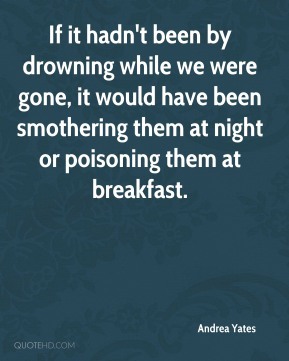 If it hadn't been by drowning while we were gone, it would have been smothering them at night or poisoning them at breakfast. 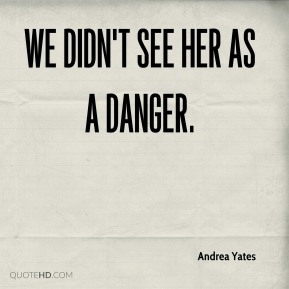 We didn't see her as a danger, ... 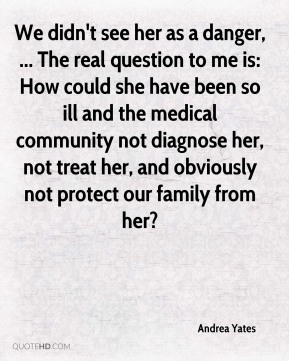 The real question to me is: How could she have been so ill and the medical community not diagnose her, not treat her, and obviously not protect our family from her? 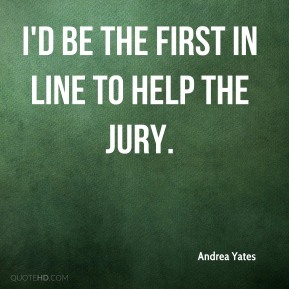 I'd be the first in line to help the jury. 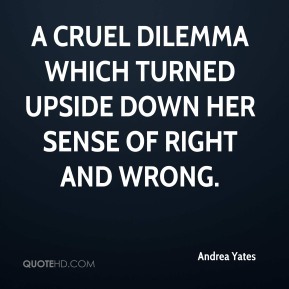 a cruel dilemma which turned upside down her sense of right and wrong. 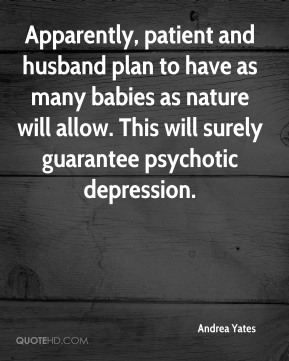 Apparently, patient and husband plan to have as many babies as nature will allow. This will surely guarantee psychotic depression. I think anyone who has a mental illness [and] who watched that should be offended. 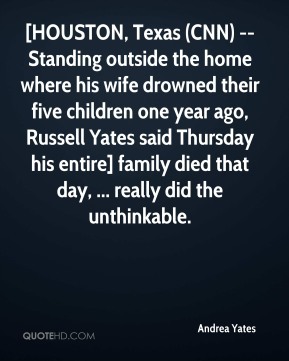 [HOUSTON, Texas (CNN) -- Standing outside the home where his wife drowned their five children one year ago, Russell Yates said Thursday his entire] family died that day, ... really did the unthinkable. 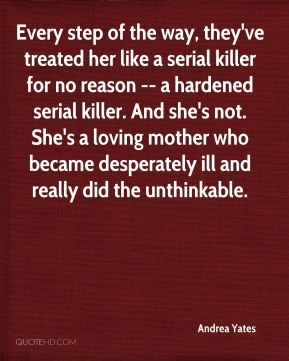 Every step of the way, they've treated her like a serial killer for no reason -- a hardened serial killer. 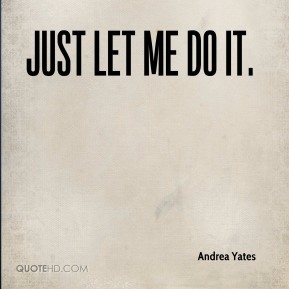 And she's not. 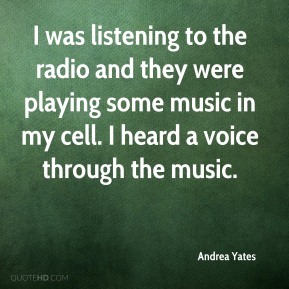 She's a loving mother who became desperately ill and really did the unthinkable.